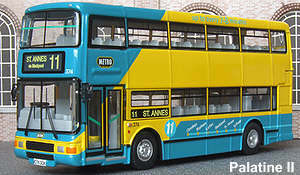 The then current Northern Counties Palatine 2 double deck bus was introduced in the mid 1990's it proved fairly successful and was particularily favoured by operators within the First Group. The Palatine 2 was dropped during the early 00's following the move to low floor vehicle types. The model was added to the OOC range in July 1998 and can be produced in two versions, either with or without a rear lower deck window.